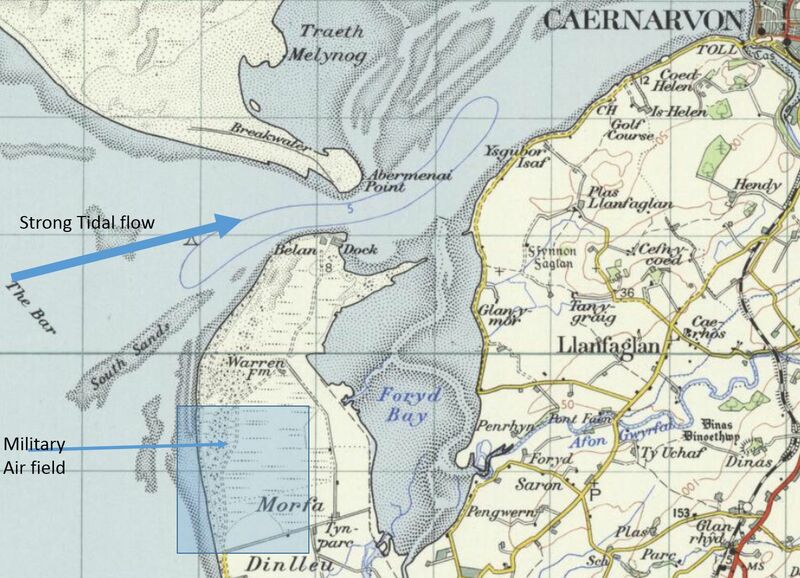 Why Amlwch was chosen as the location come down to a number of factors. Means of separating the intake from the discharge. A survey of the bromine content of sea water had been undertaken in 1938. Data from this survey and the presence of the warming gulf steam indicated further work should be concentrated on the coasts of Cornwall, Pembrokeshire and Caernarvonshire. A follow up Ariel survey was carried out in 1948 and was restricted to the west coast. 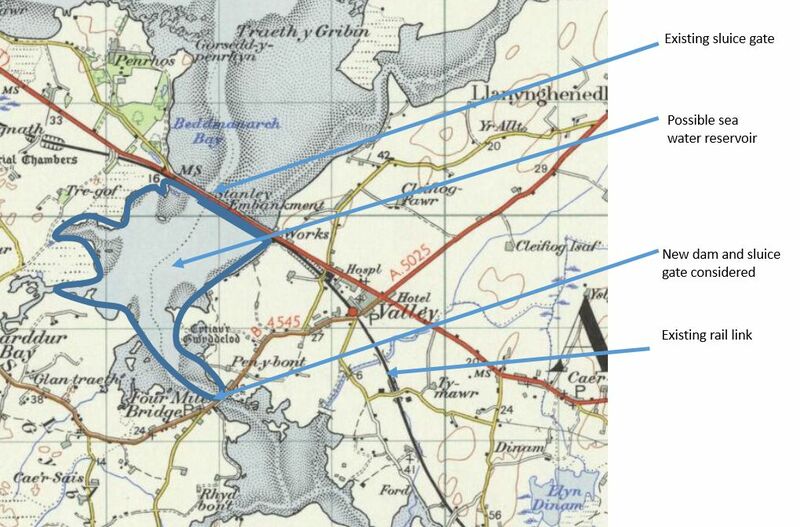 This suggested that further work should be concentrated around Caernarfonshire and Anglesey where the bromine concentration was around 68 ppm. Consideration of all the factors resulted in 4 initial sites on a short list. Belan on the southern entrance to the Menai Straits was initially on the short list. However it was eventually considered to be too close to the military airport and so discounted. 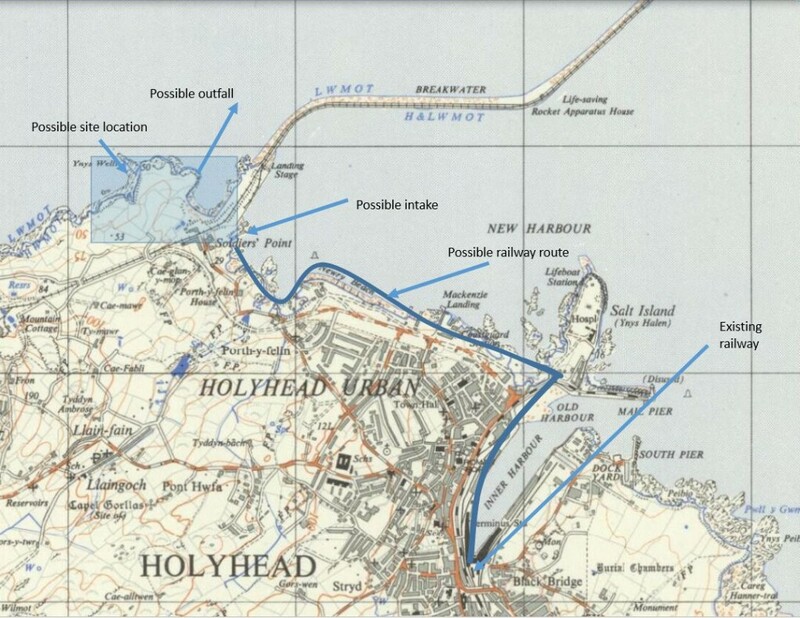 In 1949 it was recommended that further consideration was hence given to 3 sites on Anglesey, Valley Cob, Holyhead and Amlwch Each of the locations had advantages and disadvantages and all were considered possible sites. 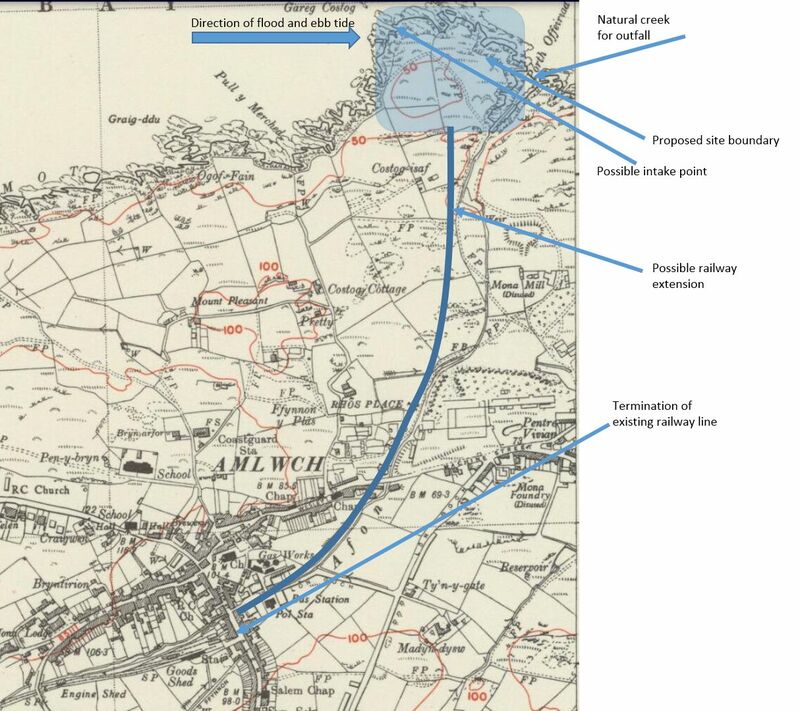 At Valley the possibility of using the Stanley embankment as a sea water reservoir hence minimising pumping costs was considered. 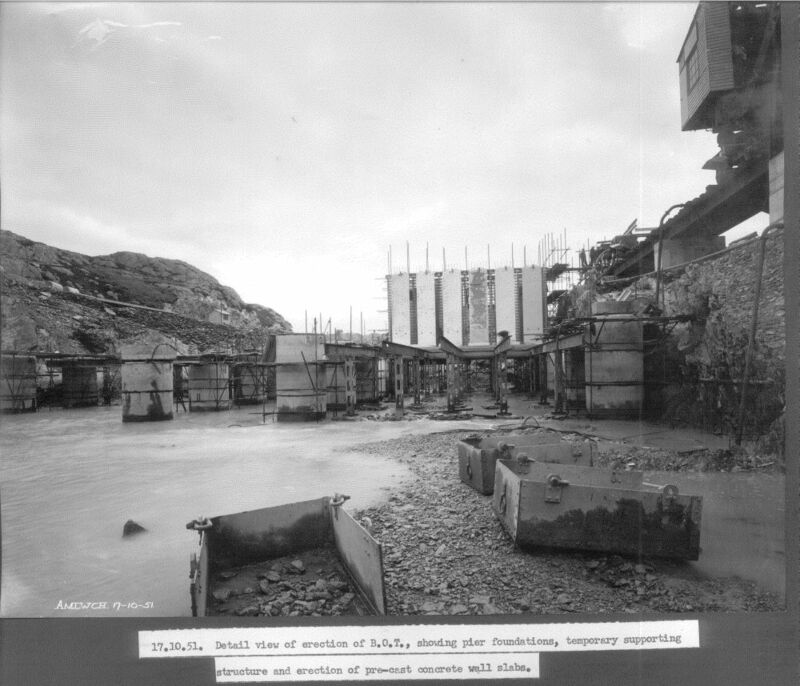 The creation of an additional dam with sluice gates was thought necessary to allow for sufficient water for future expansion of any potential works. However calculations should that rain water drainage from the surrounding land into the area could result in drop of up to 5 ppm in bromide concentration. At Holyhead consideration was given to use the breakwater to draw water from the inside of the breakwater and discharge it to the outside hence avoiding dilution. The Br2 concentration was 66-67 ppm and at sea level hence reducing pumping costs. However the tidal range was +/- 3 metres which would cause sea water supply issue, rail access was problematic and the availability of fresh water restricted. The site was eventually discarded as the potential at Amlwch was realised. When the Amlwch site was first visited in 1948 the terrain was considered unsuitable for the erection of a chemical plant due to its rocky nature, it’s ground height of +16 above mean sea water, a +/- 3.8 metre tidal range and slightly lower bromine concentration of 65 ppm. However a rail head was available close by and a natural creek meant that only a minimum amount of rock would need to be moved to build a blowing out tower and the discharge could go straight back into the sea which had a strong tidal current of around 3 knots. In addition both the flood and ebb tidal flow was to the east ensuring no dilution of feed stock would take place. A location for a sea water inlet was determined on the westerly edge of the site at a distance of 400 meters from the potential tower site. The intake was in the form of a 3m diameter tunnel bored through the base rock to a pump house located inside the site. This avoided any issues with storms etc. The pump level was set at – 9 meters from mean sea level to avoid storm surges and required the pumps to lift the sea water 24 metres. Axial flow pumps were selected for the duty. The pumps discharged the raw sea water to a large pond where it was screened and then feed the BOT via gravity. By 1951 work has started on the construction of the BOT at Amlwch.